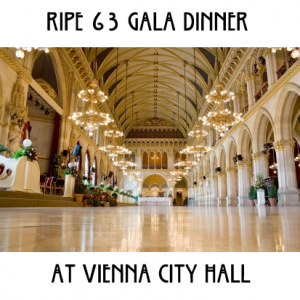 The Mayor and Governor of Vienna, Dr. Michael Häupl, requests the honour of your company at the RIPE 63 Gala Dinner on the 3rd of November in “Wien Rathaus”- the Vienna City Hall. Experience the grandeur of Viennese architecture while enjoying a sumptuous dinner, drinks, dancing and networking with your peers. 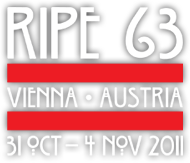 Tickets cost EUR 70 and can be purchased when you register for the meeting online or in-person at the Registration Desk. Please note that the metro directions printed on the back of the ticket are incorrect. You can find the correct directions below. Exit the Hilton from the Landstrasser Haupstrasse exit and turn left, walk four minutes, cross the Ringstrasse and you will be at the Stubentor tram/metro stop. Take tram 2 in the direction of Ottakringer Strasse/Erdbrustgasse and get off at the station Rathaus/Stadiongasse. Walk four minutes up the Lichtenfelsgasse. The main entrance of the Vienna City Hall is Lichtenfelgasse 2. Take U3 direction “Ottakring” and get off at station “Volkstheater”. Change to U2 in the direction “Aspernstrasse” and get off at “Rathaus”. A taxi from the RIPE meeting venue to “Rathaus” will cost about EUR 13, depending on traffic.